I go to Spotlight a lot and always see projects I want to do , some times I buy them then they sit there unfinished. This year I decided to actually get them done. 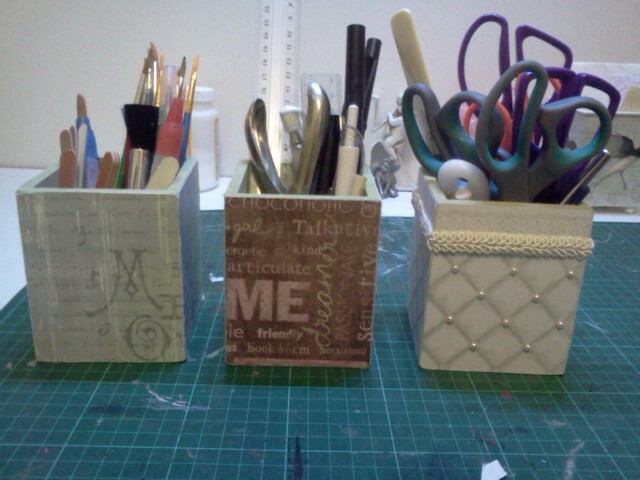 The first one I did was a little square container to hold pens etc. 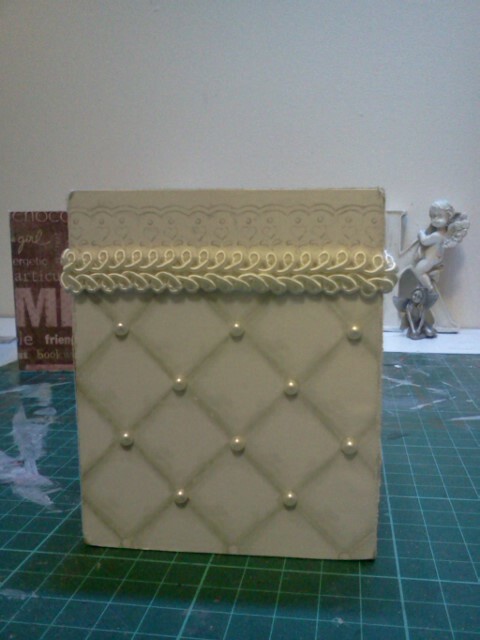 I had the perfect paper for it which looked like padded look paper in a very light mint green colour. The only problem was that I only had 2 sheets of it and there wasn't a name on the paper so I could find out where to get more, then I thought well do 3 different ones. 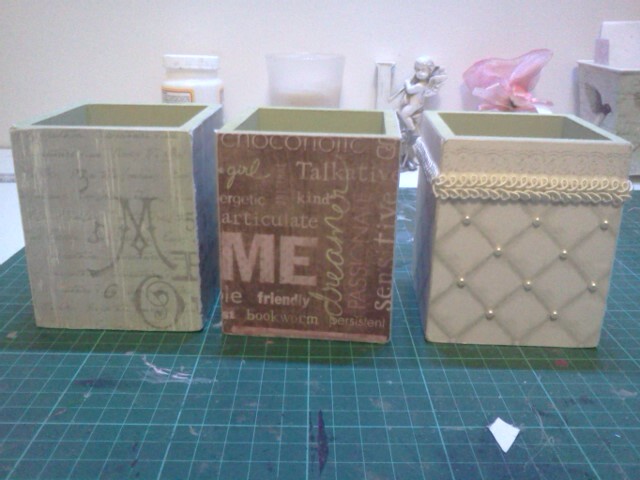 The first one is using the padded look paper﻿, for around the top I used a cream gimp braid and little cream pearls . As I wanted to keep the same sort of colour theme because I had painted the boxes with Kaisercraft Pistachio paint , I looked through my paper stash and found 2 other papers that had similar colours to the paint,all up it took me about 1/2 to finish all 3 of them off . I like them as they all have different jobs they have to do. 1 is for pens ,the others are for scissors and tools etc. These ones are just for me. As most of you know I love the colour red and butterflies. So what better way to use both. I found this awesome paper which has red tones and of course Butterflies. I found a Kaisercraft Create word at Spotlight along with a big K.
I painted the edges with a red/burgundy paint ( I think I mixed this one up ), then I covered the create with the butterfly paper, I then cut out a little butterfly and stuck it onto the word. Its now stuck on my craft wall. The K I did the same thing as I did with the Create word. I was going to use different paper but I thought why not use up the rest of the paper. I do sometimes have trouble cutting up papers but now I think with them what the hell. This paper is of course Kaisercraft P769 Sweet Nothings Double-Sided Paper 12 in. X12 in.